Every now and then I prepare a meal that I’ve been reluctant to blog about because it’s not at all fat-free. Inari are rice-stuffed pouches made of fried tofu, and they’re very easy to make if you buy Inarizushi No Moto in a can. I’ve been working on a way to make the pouches myself, without frying, but I just haven’t gotten to it yet. After all, inari is a convenience food, and I seem to forget about making it until I’m in a hurry to throw together a meal. 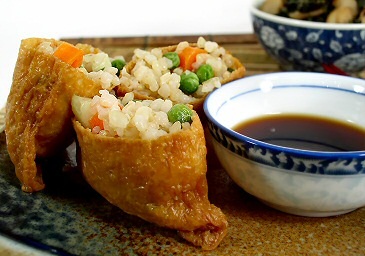 I threw together such a meal a few days ago, using the evil (but tasty) fried inari pouches. I did manage to get some of the fat out by rinsing the inari in hot water and wringing them out before I filled them. I was happy to find that they retained their delicious sweet and sour taste even after rinsing. There’s no real recipe for my inari, but I can tell you what I do. I cook about 1 cup of short-grained brown rice in my rice cooker until it is done. While it is cooking, I chop up 2 carrots and half of a large, seeded cucumber. When the rice is almost done, I add the carrots and some frozen peas (3/4 cup maybe) to the cooker, just on top of the rice; I close it up and let it complete its cooking (if the rice isn’t tender, add a quarter cup of water and turn it back on–sometimes this is necessary when cooking rice with additional ingredients). When the rice is done, I turn it out into a bowl, add the chopped cucumber, and toss it all with seasoned rice vinegar. I just add it until it tastes good to me. (Start with 1/8 cup and add more from there; it should have a distinctly vinegary taste, but not overpoweringly so.) I use the seasoned rice vinegar that already has salt and sugar, but if you’re using regular rice vinegar, dissolve a little salt (1/2 tsp.) and sugar (2 tsp.) in it beforehand. After the rice is cool enough to handle, I stuff it into the pre-rinsed pouches. I like to over-stuff mine and never bother with folding the edges over to “hide” the filling. The more rice inside, the better, in my opinion! Serve the inari with Ponzu Sauce (citrus-flavored soy sauce), lots of wasabi, and sliced pickled ginger. The over-stuffed inari were complemented by a sweet yet tangy vegetable dish that turned out to be the surprise hit of the meal. I used dinosaur (lacinato) kale and regular mushrooms, but you can use regular kale, bok choy, or most any other green along with any mushroom you like. But don’t leave out the water chestnuts, which give it some crunch, and use Ponzu, if you can, for that hint of citrus. Wash the kale and remove any tough stems. Chop the leaves into bite-sized pieces and set aside. Heat the sesame oil in a large skillet or wok. Add the mushrooms, ginger, and garlic, and stir-fry until mushrooms start to become tender. Add the kale and broth and cover immediately. Cook on medium heat, checking often to make sure that the water hasn’t all evaporated, until the kale is tender, about 5-9 minutes. (Add more broth if it becomes dry.) When the kale is tender, remove the cover and add the water chestnuts. Cook uncovered for 2 minutes. Stir in the remaining ingredients, cook for one more minute, and serve. 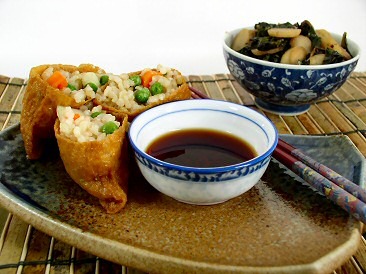 And don’t worry–as soon as I come up with a recipe for non-fried inari pouches, you’ll be the first to know! I’m going to have to look into that. Wouldn’t they have to list it on the can? Mine appear to be vegetarian. I use Hime brand and it lists the ingredients as Seasoned Fried Soybean Curd, (Soybean, Soybean Oil), Sugar, Soy Sauce, (Water, Soybeans, Wheat, Salt), Glucose, Rice, Rice Koji, Ethyl Alcohol, Monosodium Glutamate, Water. So, not the most healthy of ingredients but, as far as I can tell, vegan. Yes, and as I said, the rice I used was short grain brown rice. Not white. Yummy- too bad I didn’t realise inari is fried :-(. I also didn’t know the little pouches came packaged like that! Inari is so delicious, I think I could eat nothing but that. It is also good with some edamame mixed in, and some sprinkles of nori in the rice. Unfortunately, it isn’t just the frying of the skins that is a problem. It is a huge overload of sodium in the wrappers, in the soy sauce, in the seasoned rice vinegar. I try to follow the recommendation of 1 mg of sodium at most per calorie, and inari is orders of magnitude more, sadly.